Deadly Storms Wreak Havoc In Northeast : The Two-Way At least three people in the region, including a child, were killed by trees felled as a powerful squall line moved across the region. 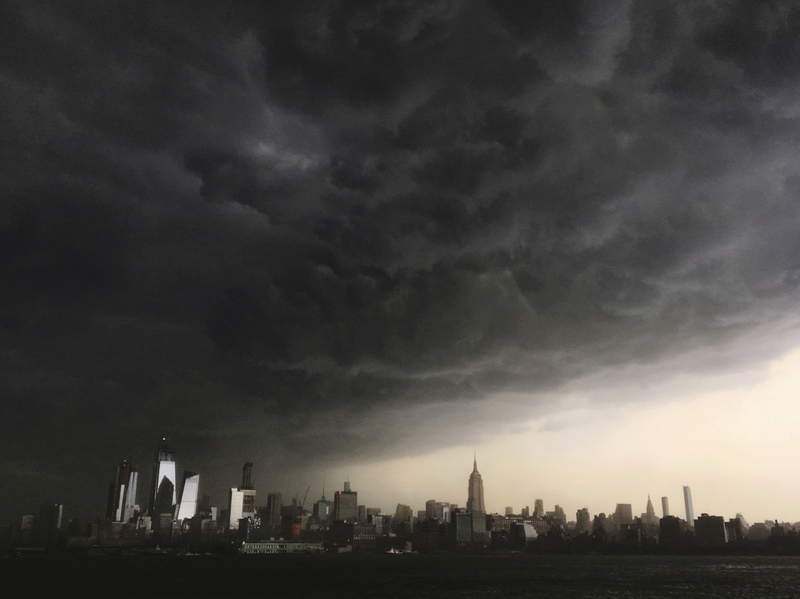 Storm clouds gathered over New York City on Tuesday as a line of strong storms pushed across much of the Northeast and Mid-Atlantic. Several people died as powerful spring thunderstorms raked a broad swath of the U.S. Eastern Seaboard on Tuesday, shutting roadways and train lines from southern New England through the Mid-Atlantic. National Weather Service meteorologist Steven Weiss tells NPR the long squall line was primarily a wind event, with "lots of trees [and] power lines down," he says. "Common gusts of 40 to 50 mph, and some gusts were stronger than that." In the city of Newburgh, N.Y., about 60 miles north of New York City, an 11-year-old girl was killed when high winds caused a tree to fall on an SUV as she and her mother were unloading groceries. City of Newburgh police Detective Sgt. Joseph Rutigliano tells NPR that the girl was declared dead at the hospital and that her mother had minor injuries. Newburgh police said the city was under a state of emergency, its 28,000 residents effectively put at a standstill as all city streets remained closed as of Wednesday morning. 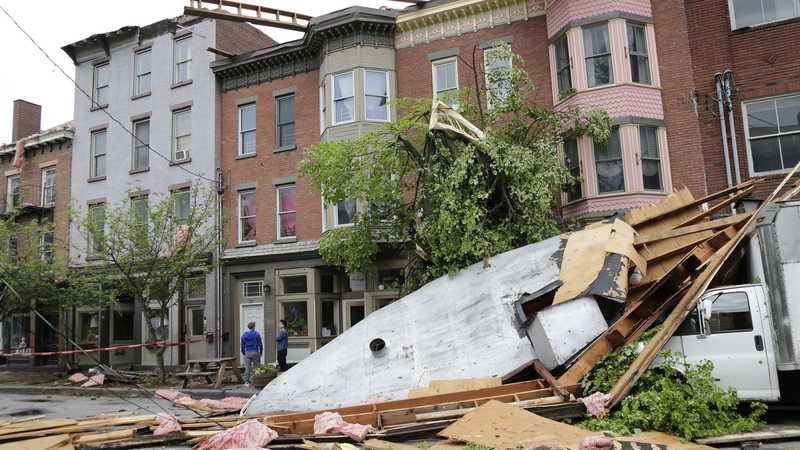 Severe weather left buildings damaged in Newburgh, N.Y., on Wednesday. In Connecticut, falling trees killed two men: one in the city of Danbury and another a few miles away in New Fairfield, according to The Associated Press. Around New York City, regional train lines shut down service as they dealt with trees and limbs strewn across the tracks, stranding evening commuters at a packed Grand Central Station. New York Gov. Andrew Cuomo declared a state of emergency for several counties north of the city, deploying the National Guard to assist with recovery. I’m declaring a State of Emergency in Putnam, Dutchess, Orange and Sullivan counties as they recover from severe thunderstorms, and deploying members of the New York National Guard to assist with recovery operations. But on top of the wind, heavy rain, hail and lightning strikes compounded the misery. In New York's Hudson Valley, for example, there were reports of up to 1,000 lightning strikes an hour. Video posted on Twitter, showed a blaze spewing black smoke near a car dealership in Clifton, N.J. In Maryland, it was heavy rain that caused problems for dozens of commuters aboard a double-decker regional MARC train outside Washington, D.C., as rising floodwaters forced them to climb to the upper level. In Frederick, Md., The Frederick News-Post reports that 85 passengers had to wait hours for the water to subside before the train was able to move at a slow pace, reaching its destination at midnight, about five hours behind schedule. County emergency workers fielded more than 300 calls to 911 as crews conducted dozens of water rescues, reports The Frederick News-Post. Across the region, efforts to reverse the damage wrought continued into Wednesday, as crews worked to clear roadways and fix power lines. There were more than 370,000 power outages, mostly in New York state, as of noon ET, according to poweroutage.us. Weiss of the National Weather Service says the worst of the weather is over for the Northeast, as severe storms are expected to move into the Plains states. Strong wind gusts and hail are forecast in western Texas on Wednesday, before moving into parts of Nebraska and Kansas later in the week, Weiss says.